This specialty club can get you out of tough spots around the golf course. Reliable play with your wedges can help you lower your score on the golf course. Skilled golfers often keep up to four different wedges in their bag for play inside 100 yards and around the green. Each wedge has a different loft to make it useful in specific situations. The gap wedge's loft depends on the brand and model of the club. Most gap wedges have a loft of between 50 and 52 degrees. Among wedges, this club has a low to moderate degree of loft and is sometimes call an approach wedge. 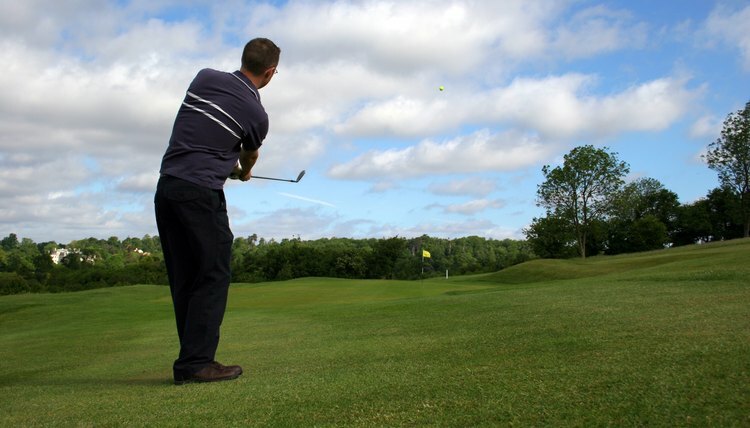 A pitching wedge has the lowest amount of loft, meaning that will send the ball farther than the other wedges. Next in loft and decreasing in distance are the gap wedge, sand wedge and lob wedge. A pitching wedge has a loft of between 45 and 48 degrees, sand wedges range from 54 to 56 degrees and lob wedges have lofts between 60 and 64 degrees, in most cases. Golfers use their gap wedge when they need slightly more height on their ball than they would get with a pitching wedge and slightly more distance than they would get with a sand wedge. A gap wedge is suitable to use when your ball is in longer grass, or rough, and when it is on shorter grass, or fairway. Gap wedges are often included in beginner, intermediate and women's sets of clubs. The wedge literally fills the distance gap between the pitching wedge and sand wedge. Without it in the set, golfers find that the pitching wedge is too long for a particular shot, but the sand wedge will not send the ball far enough. Some golfers choose not to carry a gap wedge because golf rules allow only 14 clubs in a player's bag, but these golfers are quickly becoming the minority.